Two hours already! 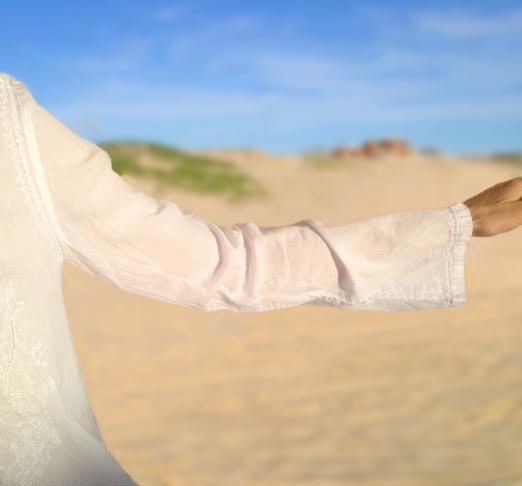 It was late afternoon, I was dressed all in white and sitting on a beautiful, wild, windswept beach with a group of excited strangers, waiting. The anticipation was palpable. 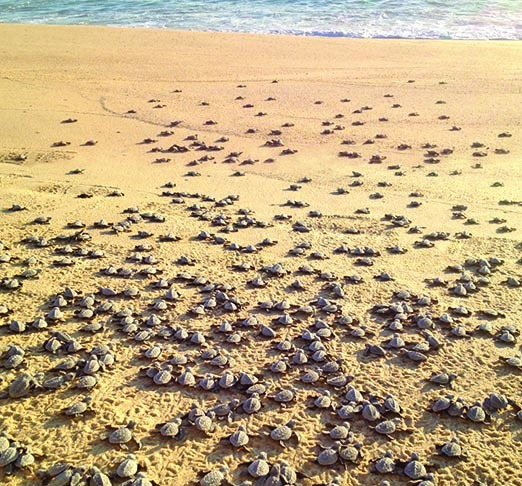 We were waiting, staking places in the sun and the sand, not for the Pope nor the President, not even for Godot or Bono, but for a bunch of tiny turtles, newborn and about to be released back into the ocean. Which explains my white on white outfit. After all, this would be a baptism of sorts, wouldn’t it? I’ve been on a turtle release quest for ages. 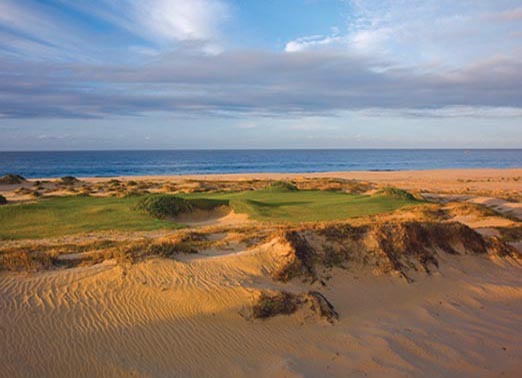 Now, finally, I was about to see one- at Diamante Cabo San Lucas, an oceanfront golf community with some of the most beautiful and exciting courses set against a gorgeous, sweeping coastline. 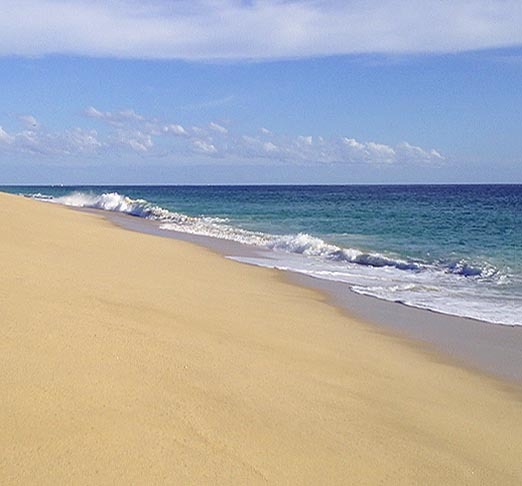 I was happy it was on this beach because I love the Pacific side of Cabo. 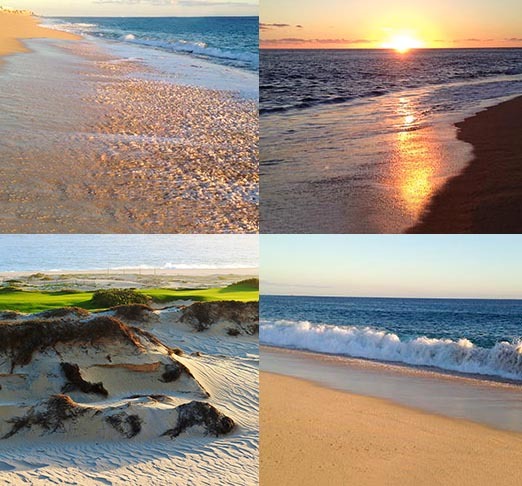 Here, the ocean is majestic, wild, dramatic. Too tempestuous for much water activity and therefore more desolate. You come here to dream. 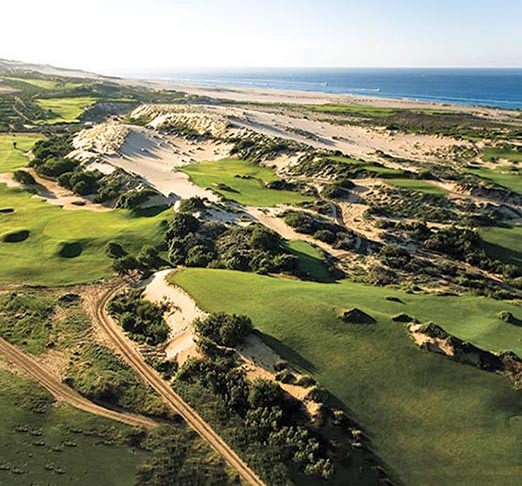 Medano, Chileno and Costa Azul have their appeal. But give me the Pacific side any time. The type of sea turtle we were waiting for, the Olive Ridley or Golfina, is one of 5 species found in the waters off Baja California Sur. At 90 pounds on maturity, it is the smallest. 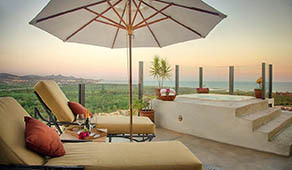 All species are endangered and protected in Mexico by an excellent conservation program involving local hotels, resorts and government agencies. I was relieved to know that the program was proceeding as usual after Hurricane Odile, that the storm did not destroy the nests. 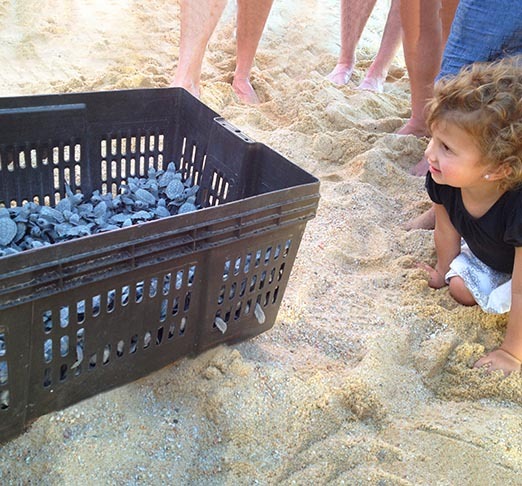 During turtle nesting season, June through February, female sea turtles return to the beaches where they were born to lay their eggs. This is a really vulnerable time for the eggs and the hatchlings. There are just too many natural predators and man-made hazards. To give them a better chance at survival, conservation groups step in. 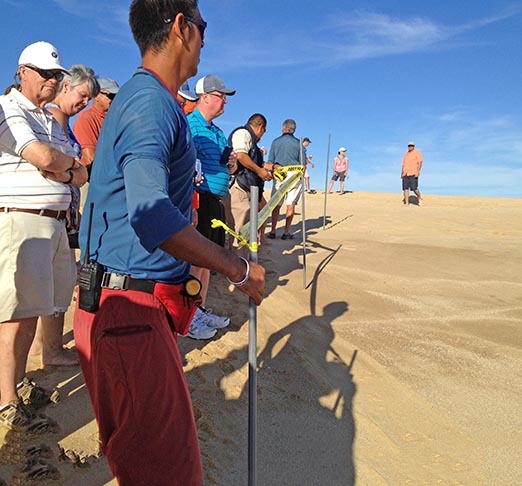 They patrol the beaches along Cabo San Lucas and San Jose del Cabo daily for new nests. 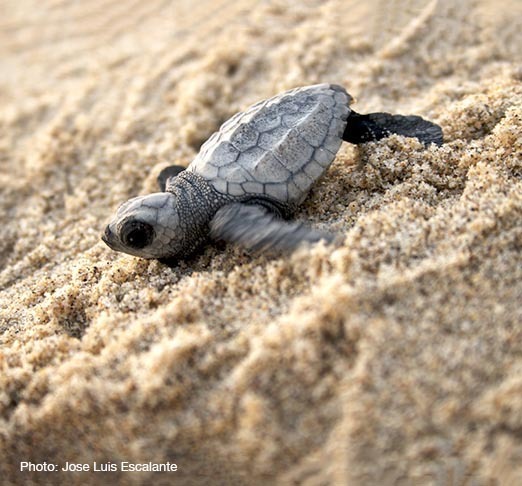 When they find one, they carefully remove the eggs and take them to a mother nest in a protected part of the beach where they incubate safely for the next 45 to 60 days. 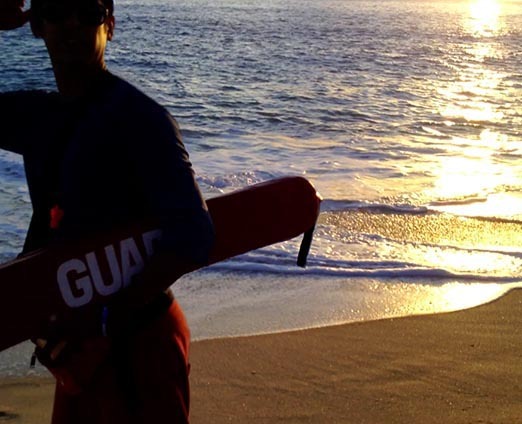 Which brings us to this moment on the beach. 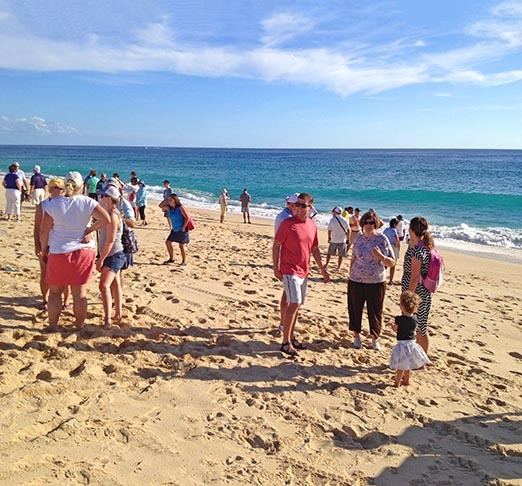 Today was the day the eggs were going to hatch and the babies released into the ocean. Except, where were they? We’d been waiting it seemed like forever. The troops were getting restive! Several false alarms. A dune buggy appeared on the horizon. The crowd froze. Was this it? No. Just some Diamante personnel with a cooler of refreshments. Not a bad idea. Then someone came over and roped off a section of the beach and smoothed it over. A turtle red carpet! 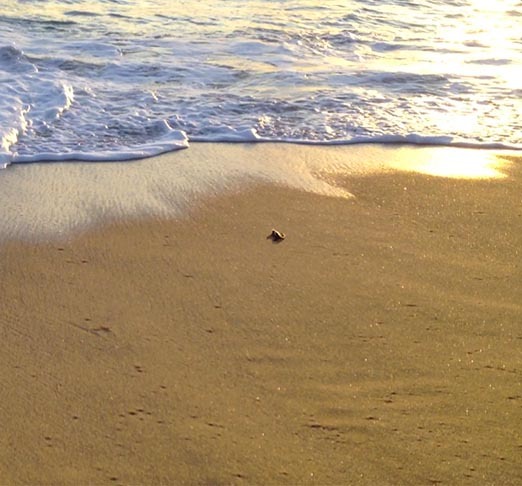 Actually, the smooth sand is to make it easier for the turtles to crawl to the ocean. These preparations just made us even more crazy with anticipation. Suddenly and in an understated fashion, the moment we had all been waiting for arrived. 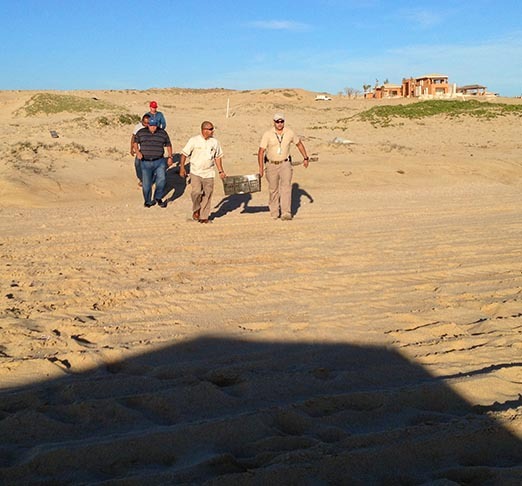 Two men appeared over a dune carrying a milk crate and walked to the roped off area. I had imagined something a little more spectacular, as befitting the occasion. A grand entrance in some sort of official or scientific looking vehicle perhaps. In a special container on the lap of someone in a lab coat… But this? We crowded in to see. A universal ooooh. Everybody melted. A bin of 580 squiggly, squirmy, fluttery little bits of pure adorableness. Most likely these were females, the warm waters off Mexico being more favorable for the development of females. Each turtle was about an inch long, dark with a silvery dusting and full of energy. We were told that they came from 6 different nests, and had just been born. I got as close as I could. Their little flapping arms and quick movements made a whispery, clicking sound. They smelled of the sea. 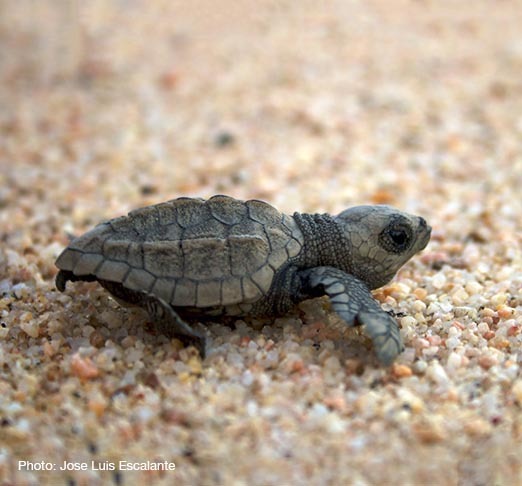 Before we could lose ourselves in too much cuteness overload, Carlos Villalobos, head of the Diamante Turtle Protection Program, sobered us up with a little lesson on the plight of the sea turtle. Only one in about a 1,000 will survive to maturity. Many don’t even make the journey from the nest to the sea. 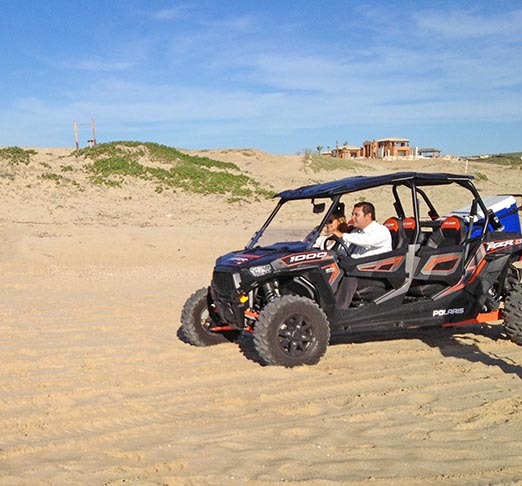 Besides natural predators, oceanfront development, ATVs, pollution and fishing nets do the rest. I looked at our 580- and tried not to do the math. 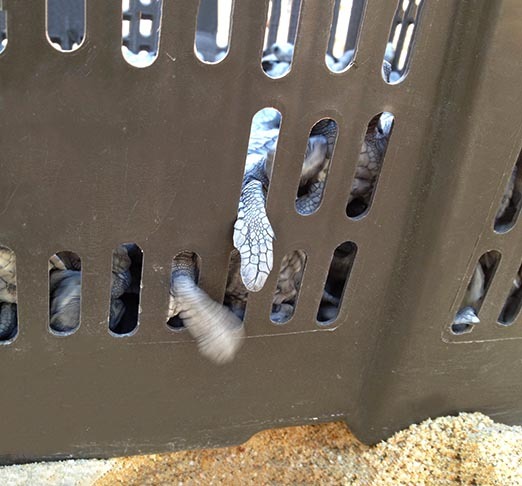 The crowd let out a big cheer when the hatchlings were released. 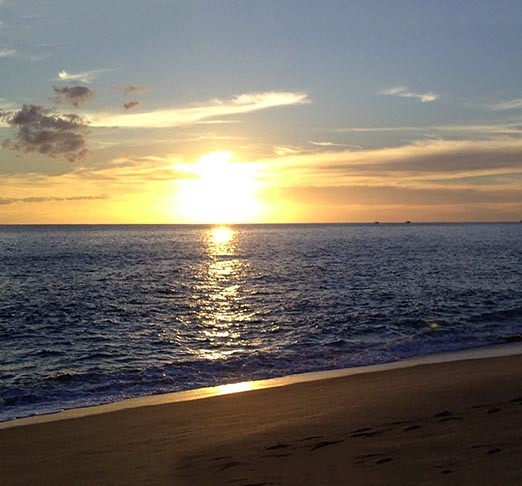 By this time, it was getting close to sunset, a time chosen specifically for releases because it is safer for the turtles. The minute they hit the sand and started crawling was amazing and surprisingly emotional. Even grown men were calling out and clapping like proud papas. 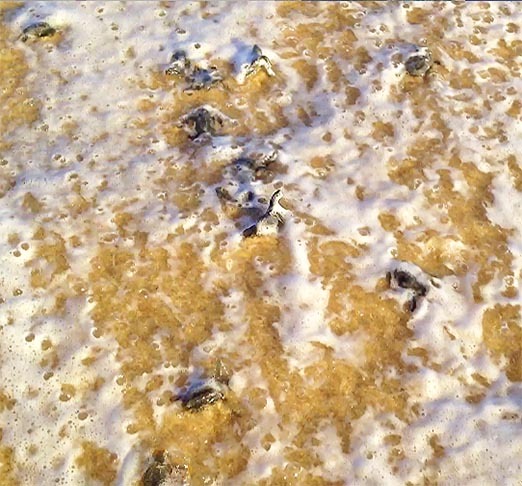 The turtles went right for the ocean, 580 of them crawling fast (as much as turtles crawl fast). Only half an hour old, and they knew what to do. More cheering and applause when the first one disappeared into the waves. So much love and good will! The way turtles actually get into the ocean- its not exactly like they march boldly in and start swimming, theme to Chariots of Fire playing in the background. Its much more prosaic and haphazard. The turtles wait at the water’s edge like at a bus stop, a big wave sweeps them up. Sometimes this works, but most times the wave just plops them right back onto the beach and they have to start all over again. And again. Even though the waves beat them up and toss them around. By sunset, most of them were gone. The last few stragglers, too weak or confused to make it on their own, were given a helping hand by conservation members. It seemed fitting that the turtles should walk off into the sunset. A positive and hopeful sign. But the deepening sky made the ocean a lot more imposing. I worried about them, so new and so small, making their way alone in that dark and inhospitable expanse. The challenges ahead seemed daunting. Where would they go? Japan? Peru? Would they be lonely? 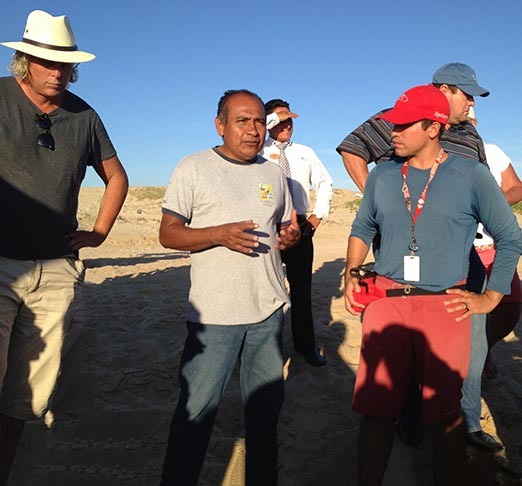 It will be another 18 to 20 years before they return to land. To this very same beach, in fact, to lay their eggs. 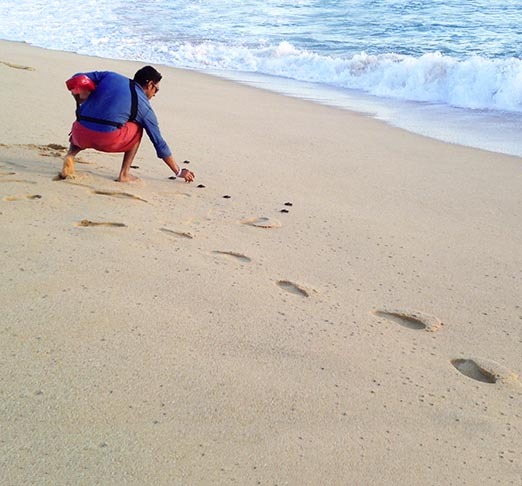 Incredible as it sounds, the turtles had gathered enough cues from that one journey down the sand to guide them back. Fierce little fighters, fighting for their lives and for their place on this earth, the turtles I saw that day were true ninjas. 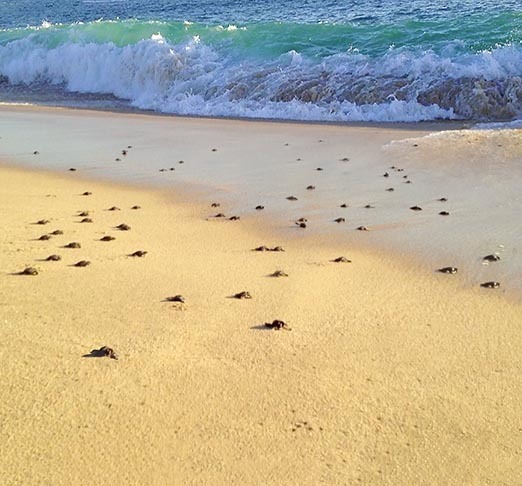 If you happen to be in Cabo or San Jose during turtle season, be sure to catch a release at one of the participating hotels and resorts. A turtle release isn’t flashy and extroverted like whale watching, but trust me, this is an amazing experience you won’t want to miss. 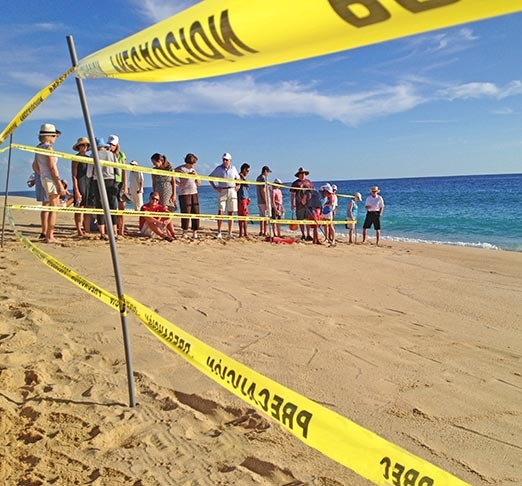 Cabo San Lucas Sea Turtle Release from Los Cabos Real Estate Magazine on Vimeo. 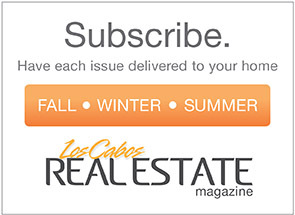 For the past 15 years, Los Cabos Real Estate Magazine has been the premiere real estate publication in the Los Cabos area. With over 250 listings in each issue, we not only offer a broad spectrum of homes, lots, developments and commercial property, but also represent most of the major realty companies in the area. 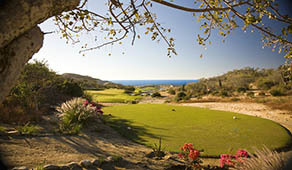 Our listings include Cabo San Lucas, the Corridor, San Jose, Todos Santos and Eastcape. If you have been to Los Cabos, you are probably aware of our magazine, as we distribute in all the important, high traffic areas and realty offices in the region.